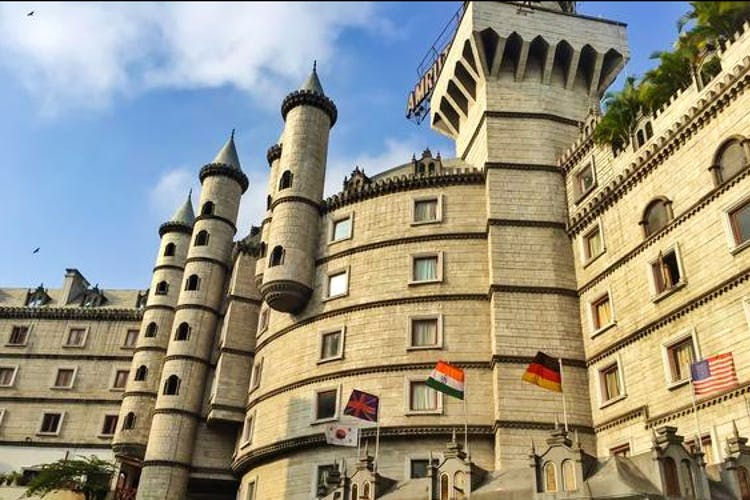 Fulfill your fairy tale fantasies and live in this castle hotel in Saifabad. Amrutha Castle is an amazing getaway from city life, although it is located inside the city. Located in the heart of the city, Amrutha Castle often makes heads turn with its dramatic exteriors. The architecture is brilliantly done, and it will remind you of the Bavarian Castle on whose lines it was built. So, if towers and parapets excite you, go here to unwind fashionably over the weekend. Stay at a suite, club room or one of the standard rooms, and take in the medieval vibe at this four-star hotel. The amenities here include a rooftop swimming pool (we’re in love with it), sauna and steam bath, a fully equipped health club, and every room facilities a mini-bar, an LCD television, satellite channels, WiFi, electric kettles, and more. Just the right touch of modern living in an old-fashioned castle, don’t you think? It has 90 tastefully done rooms and suites, so no matter how big of a squad you have — you can always have a staycation together. The rooms have elements from the medieval era like shields, swords, and paintings, and are truly fascinating. You can relax in peace or walk through the corridors, and even enjoy a view of the busy city from the rooftop. Castles are also known to be romantic, so if you wanna take bae on a staycation, you should totally consider this place. They also have a beautiful dining area in the lobby where you get tasty continental food, and there’s a café too. Besides, you get free breakfast here. Food woes? Sorted! So go ahead and make memories or just have some peaceful me time in a fancy castle. We are planning to check in, take photos and videos to make a retelling of many Game Of Thrones episodes. Who’s in?